Charlie’s Overhead Door: the garage door specialist! At Charlie’s Overhead Door, we know everything about garage doors, door openers and related products. With over 30 years’ experience, our family-owned business is totally specialized in garage door sales, installation, maintenanceand repair. How do we set ourselves apart from our competition? By providing top-quality products and personalized customer service at competitive prices. 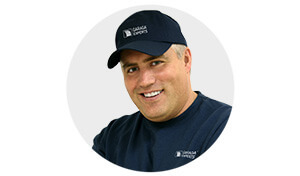 For your garage door needs, we offer you nothing less than the best brand on the market: Garaga! With their wide variety of models and colours, you are ensured of finding the garage door to go perfectly with your home’s architecture. Visit our image gallery now and view many different garage doors styles! Would you like to learn more about garage doors? We can bring our showroom to you and, like a friend in the business, give you advice to help you make the right choice. Whether your project is residential, commercial, industrial or agricultural, we can handle it. If you want to get a price now, don’t wait any longer - complete our online quotation form today. Your garage door is the biggest moving part of your home. Just like your garage door, your door opener has to be built to last and carefully chosen. Getting advice from a professional is essential. At Charlie’s Overhead Door, our well-trained team will be glad to suggest the best model based on your needs and on your garage door choice. We work only with and recommend the top-of-the-line LiftMaster brand. Manufactured by the Chamberlain Group, their products are designed with safety in mind. At each stage of production, Chamberlain uses superior material to produce the most reliable and best performing motors on the market. Learn more about their features in our door section. We offer models for both residential and commercial installation. At Charlie’s Overhead Door, you will get the answers to your questions. We treat our customers the same way we like to be treated: with respect. We have never left a job unfinished, and this is how we will continue to work. A proper installation which meets the highest safety standards is a must. We are experts in installation and repair. Furthermore, Garaga has certified us as Garaga Expert, another proof that we are all well-trained and experienced about how to do our installations properly. If your garage door needs any repair, do not hesitate to give us a call. We can fix any garage door brand. We proudly serve Oxford Countyincluding Woodstock, Ingersoll, Embro, Plattsville and Paris. Give us a call now or schedule a service call right online. We look forward to serving you soon.